Once upon a time there was a girl who really liked to drink tea and eat toast. When the girl moved into a lovely new flat, she decided to treat herself to a special kettle. The kettle, which was a special as the flat itself, was plum-coloured. 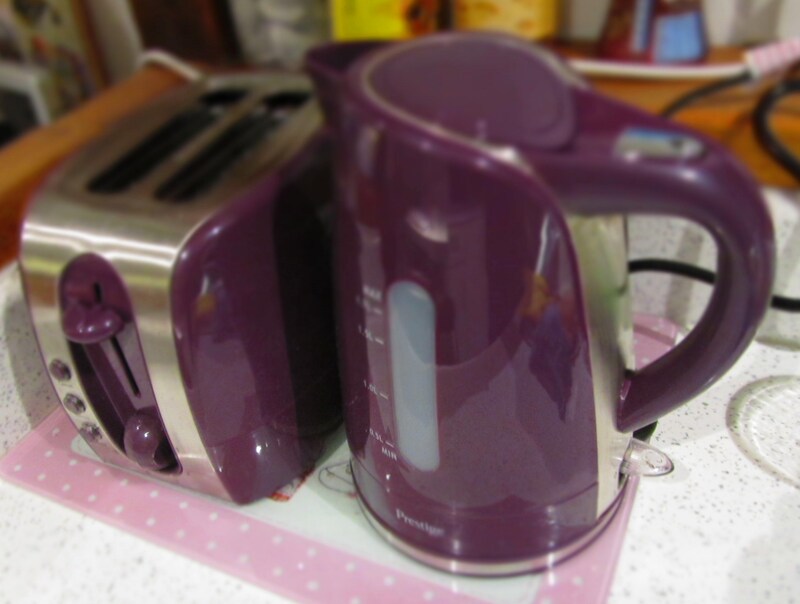 Liking the look of the kettle so much, the girl decided to buy a matching toaster. They all lived happily together, and the girl enjoyed a few months of delicious hot tea and buttery toast. One Sunday (last Sunday, in fact), it was late, and the girl decided to make a cup of hot chocolate before bed. She filled the little plum kettle and flicked on the switch, but the blue light didn’t come on. She looked at the kettle, sitting next to the toaster, and sat down with a sigh. “No hot chocolate for me tonight then,” she thought. Try as she might, she couldn’t get the kettle to work. It appeared to have died. That night, the girl went to bed with a heavy heart and a luke-warm hot water bottle. You see, she had bought the little plum kettle in September, and it was January now… and she hadn’t kept the receipt. Two days later, having dug through her bank statements in an effort to prove that she had bought the kettle where and when she said she had, she picked up the little plum kettle and took it all the way into town. The toaster sat lonely in the kitchen for a whole day, sad without its matching friend. Arriving in town bright and early, the girl took the little plum kettle straight to the shop it had come from. “Yes?” said the shop keeper. And with that, the shop keeper climbed up a ladder and fetched a brand new little plum kettle for the girl. The girl beamed all day, and was so happy to finally go home and unpack the brand new little plum kettle. Placing it next to the toaster, her kitchen was complete again. Let’s hope the same thing doesn’t happen in a few months’ time. I got through three pairs of the same pair of hair straighteners in two years before I decided it was time to try a different brand!